Additional Info: Grapefruit is stated to be originally indigenous to Jamaica. Some people mix it up with pomelo, which belongs to one family, but is characterized by larger size and different form. Grapefruits grow on a tree which may reach from 26 to 30 feet in height. Grapefruits have from 4 to 6 inches in diameter and are round in their form. The peel is yellow, occasionally with pink tints. Fruit pulp is red, pink or yellow-colored, sweet, acidic, and a bit sharp. The largest percent of total grapefruit production belongs to the US, which supplies the global market with almost 40% of total share. More than a half of this is used for making canned products and juices, while the rest is distributed fresh. Contains bioflavonoids and other plant chemicals that protect against cancer and heart disease. Includes bioflavaonoids and a variety of components commonly found in plants, which are effective in preventing heart conditions and cancer. Used For: Grapefruit is known to stimulate appetite, improve digestive functionality, treat stomach conditions, increase metabolic rates, and induce urination. 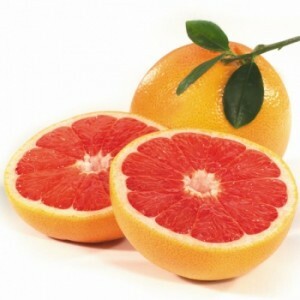 Some individuals believe sincerely that grapefruit is capable of decreasing fat amount in the body. However, individuals who keep a grapefruit diet, lose pounds due to the fact they hardly eat something else. This eating pattern may damage the organism, as it is low in necessary nutrients. Grapefruit may be included into a slimming diet, as its calorie value is rather low, hardly reaching 100 calories per serving, and its nutritional constitution can make one full. People, who are craving to lose pounds, should consider eating grapefruit as a snack, as it will reduce their calorie intake. Grapefruits have a rich content of pectin, which is responsible for decreasing cholesterol levels in blood. According to recent researches, grapefruit is rich in elements which may impede the development of several health conditions. Red and pink varieties contain much lycopene, the substance of antioxidant character which may impede the possibility of prostate cancer. There is still no exact evidence for the principle of lycopene’s action on cancer, but, according to a study which counted 48,000 doctors, 10 portions of lycopene-containing meals per week may decrease the possibility of prostate cancer by 50 percent. Among other helpful grapefruit elements are phenolic acid, which decreases the production of nitrosamines, responsible for cancer development; monoterpenes, terpenes, and limonoids, which stimulate the excretion of enzymes and thus impede cancer development; and bioflavonoids, which decrease the production of hormones, triggering tumor development. A range of individuals suffering from lupus, rheumatoid arthritis and a variety of inflammatory conditions, state that consuming grapefruit on a daily basis helps soothe the symptoms. This grapefruit’s capacity probably originates from its constituents, which can impede prostaglandin actions. Prostaglandins are known to be a reason of inflammations. Safety: People, suffering from an allergy to citrus fruits, should be very careful eating grapefruits. The body may react to peel oil and the fruit itself. Grapefruit is known to increase the medial activity of some commonly recommended remedies. Grapefruit juice can decrease a certain enzyme in the bowels, which takes responsibility for penetration of medical elements to the blood flow. As a result of such decrease, the amount of medical elements in blood increases, thus increasing the possibility of adverse effects, produced by a medicine. Studies, conducted on grapefruit juice, state that furanocoumarin and flavonoid components are the elements which reduce enzyme activity, which is highly necessary for drug metabolism in the body. As a result of interaction, the amount of some commonly used medicines in blood may drastically increase. The amounts of toxic traces, left by these drugs, may increase in individuals who drink grapefruit juice. Their increased quantity in blood may result in organ destruction and disorders, which may be harmful to one’s health.